If you’ve read the reviews of the KLE Innovations products on this site, it should be no surprise that I would at some point in time get around to installing the KLEI Pure®Harmony RCA Plug onto the one-piece silver litz loom installed in my Audiomods tone-arm that supports a Denon DL-103 moving coil cartridge. My Turntable started its life 32 years ago as a Rega Planar II, but over the years, after applying a series of modifications and upgrades (please see Turntable Mod's and Denon DL 103 Tweak for details) it has been transformed into a device with outstanding performance characteristics. The only things left over from the old Rega turntable is the lid and the on/off switch. 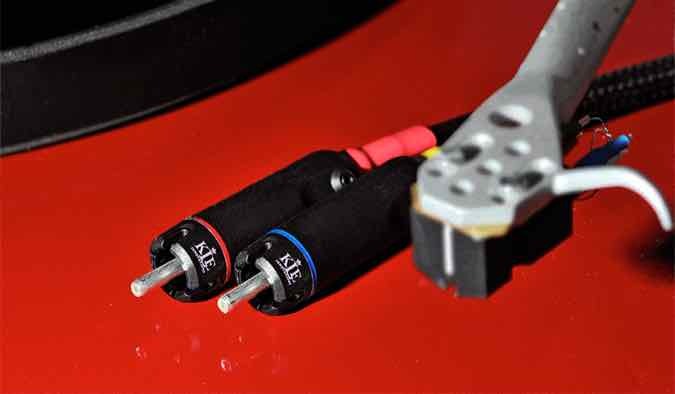 The installation of the KLEI Pure®Harmony RCA Plug was very simple; the most difficult part of the operation was removing the stock RCA plugs, which had a crimped cable strain relief, but soldering the extremely light gauge wires was a doddle, thanks to its redesigned signal and neutral tabs. Once installed, all that was left to do is burn them in - for 200 hours – c’mon KL, really? That’s an awful lot of exercise, finding an album, changing sides, putting them back on the shelf. No wonder audio streaming is getting popular. Well, 200 hours may be the optimal burn-in time recommended by KLE Innovations for ultimate playback quality to prevail. However, for this particular application, it appears you don’t have to wait that long for some really mind blowing improvements to be heard from your treasured analogue rig. Initially, the KLEI Pure®Harmony RCA Plug has a tendency to be a little bright and more than a little edgy, at least on my system. It took around 20 hours for that to settle down and transform into a very smooth and incredibly detailed performance. Which was nice, because with 180 hours left on the clock, I was giving some serious thought to installing the RCA’s onto an interconnect and letting my streamer and DAC complete the burn-in process – a much less time consuming approach. At around 30 hours I became very impressed with the performance improvements. Dynamics were very fast and extremely crisp. The image is deeper than before, but there is more spacing between the instruments both left to right and front to back, e.g. each “section” in the orchestra (i.e. violins, violas, cellos etc.) have significantly more width to them. The improved clarity in complex orchestral tracks allowed them to be played louder without distortion – 1812 with digital cannons anyone? But the one outstanding quality of the KLEI Pure®Harmony RCA Plug was their transmission of incredibly fine micro-details that seemed to bring a “new reality” to my vinyl collection, especially some older live recordings. It was apparent on the very first track I played, Baby Please Don’t Go from the 1973 album Better Days by Paul Butterfield, featuring Ronnie Barron, Amos Garret, Geoff Muldaur, Christopher Parker and Billy Rich. I dropped the arm and was returning to my chair, but I never made it. As soon as the track started playing I spun around to listen more intently, standing, the sound so totally different from any previous plays. The extremely fine details of the bottleneck sliding on the strings was just downright eerie, like a ghost from the past. Many tracks sounded as though they were recorded in a gospel hall with two mikes and a stereo reel-to-reel. The natural reverberations are melded superbly with the musicians and their vocals and then reproduced in my system with a haunting reality. For me, this was a complete jaw-dropper. I’d heard some very expensive systems that may have approached this level of reproduction, but I never expected my current configuration would be capable of such a refined and detailed presentation. And all this was due to the KLEI Pure®Harmony RCA Plug? - You got it! The Doctor, by Doc Powel - with his beautifully mellow jazz guitar, piano, drums and bass. But the outstanding instrument for me was the superb reproduction of the drums, especially the cymbals. Again, the reproduction of the natural reverberations from within the venue is a significant contribution to the reality portrayed. Songs From The Wood by Jethro Tull (1977) – I’ve mentioned this album in previous reviews, where I found the vocal harmonies to be the most profound of Tull’s “signature sounds”, but after installing these RCA’s the reproduction of those vocals to this level of detail is astounding. Boomers Story, by Ry Cooder (1972) – again, I ‘ve mentioned this album in previous reviews and again I mention the superb reproduction of his use of the bottleneck. A “bottleneck” is a tube of glass or metal that the musician slides on the strings over the fretboard. Why am I so enamoured by this particular sound? e.g. just the vibration of the strings against the bottleneck when simply sliding it up the strings is a detail seldom reproduced in a believable manner. But when it is - goosebumps! LEGEND: The Best Of, by Bob Marley and the Wailers (1984) – whilst not really in the same league as those above for it’s natural venue acoustics, the studio tracks are extremely well engineered and yields the widest image of my entire collection) – which now exceed the width of the speakers by a couple of feet. Down to the Moon by Andreas Vollenweider (1986) – again – not a really natural sounding album, but exceptionally well-engineered. The outstanding feature of this album is it’s micro details and associated dynamics, i.e. those little details you hear when strings are plucked, like the fingernail catching the plucked string – as with a Harp. This album brought Harp music to the mainstream back then, but it has never lost it’s appeal and now with the vastly improved reproduction it can be enjoyed all over again, like a new album. Raising Sand by Robert Plant and Alison Krauss (2007) – for me, this was one of those albums you regret buying. You know, you get it home and it just doesn’t do anything for you. But it stayed on my shelf, seldom played. Well, that was until I started to audition the KLE Innovations product line, after which the album perked up and things started to gel. It seems that before installing KLEI products I was missing so many details in many of my recordings. In this case the album sounded lackluster and had no excitement – not any more, it reproduces extremely fine details and vocal textures from these two exceptional artists are outstanding. One last artist that really presents a challenge to any system, particularly where clarity is concerned, is Mike Oldfield, remember Tubular bells? There’s also Omadawn, and Five Miles Out among others. But the one thing they all share is big sound, lots of multi-tracking instruments and incredible details, a lot of which can be lost. Well not any more – with the KLEI Pure®Harmony RCA Plugs in the system those details shine through with scintillating glockenspiels, astounding tubular bells, crisp distorted guitar licks and airy background woodwinds – absolutely stunning. I haven’t mentioned any classical recording, mainly because it would lengthen this review considerably. However, it is worth mentioning that the KLEI Pure®Harmony RCA Plugs conveys a reproduction where the venue in many orchestral tracks appears as cavernous as the actual space it was recorded in, with a precise placement of musicians in the overall image and a clarity that completely exceeded my expectations from such a simple RCA upgrade. A set of the KLEI Pure®Harmony RCA Plugs cost around US$120 for a set of four, but the improvements made in my system on this one component was as significant as replacing the cartridge costing substantially more than that, making it an extremely attractive investment. What do you do with the two remaining plugs? – you find an analogue buddy and you blow his mind as well. The most significant improvement the KLEI Pure®Harmony RCA Plugs made for me was the reality that is now conveyed, which is one of those ethereal qualities that is so hard to measure and even more difficult to describe. It is also subject to our own experiences. The greatly improved reproduction of venue acoustics from my system following this particular upgrade, often triggers memories of my own experience of playing in bands in many different locations, from small village halls, to nightclubs, to medium sized venues, each with their own very unique acoustic signature. The Denon DL103 moving coil cartridge has been around for a very long time and at $229 it is a steal. There are a couple of minor warts and there are a few outfits than can modify this cartridge to get it to perform much much better. But before you opt to have the cantilever replaced, or have the cartridge “nuded” or have it mounted into an alloy or wooden head-shell, try this modification first. You will be amazed by the improvement in detail and you don’t have to wait the 6-9 weeks that the other options will take. The 200 hours burn-in time appeared to me to be substantially shorter and I have not heard any improvements in performance since around the 60 hour mark. That may be due in part to the WBT high content (4%) silver solder I used, which I have found to perform extremely well when installing the KLEI Pure®Harmony RCA Plugs onto my interconnects also. If you consider implementing this tweak, I would also strongly recommend for the phono stage to amp connection, either the KLEI Zero3 Interconnect , or better still the KLEI ®gZero6 Interconnect to compliment this change, since together, they will provide the best possible pathway from cartridge to amp you could possibly have. This is definitely a “MUST HAVE” for turntable arms having a one piece continuous loom!